A couple weeks ago I got the Bouchon Bakery book. I kept seeing it everywhere and was drawn to it (possibly because it was covered in plastic and I was oh so curious about what magical baking photos and recipes were inside). So I decided to just go ahead and order it through Amazon and boy was I excited when it arrived! The first night I literally could not put the book down. I even read through all the beginning sections about how to measure ingredients and calibrate your oven (just in case). For anyone not familiar with the book, it is a collaboration of several chefs and bakers who run the Bouchon bakeries in the US. Keller apprenticed in France so I think it’s fair to say a lot of the recipes have both a French and American influence. I love that the recipes they share are the same recipes they use in the bakeries. They also list exactly what brands of products they use so you can recreate the professional product at home. Having said that, a lot of the ingredients are fairly specialized, making them somewhat difficult to track down for the at-home baker. Feeling ambitious, I had planned to make my first recipe from the Bouchon book on Sunday (this was before I realized how much wine would be consumed at the CA ball on Saturday night and how less than ideal I would feel on Sunday morning). But, since I spent a lot of time the week before tracking down exactly the right ingredients (70% cocoa Valrhona chocolate, neutral glaze…), I figured there was no sense in postponing the baking! 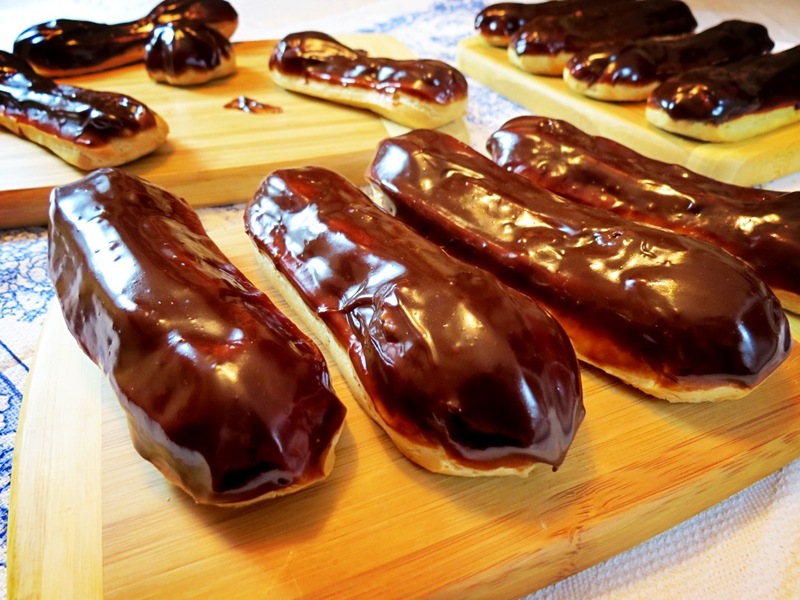 So on Sunday, I made my first ever batch of eclairs! 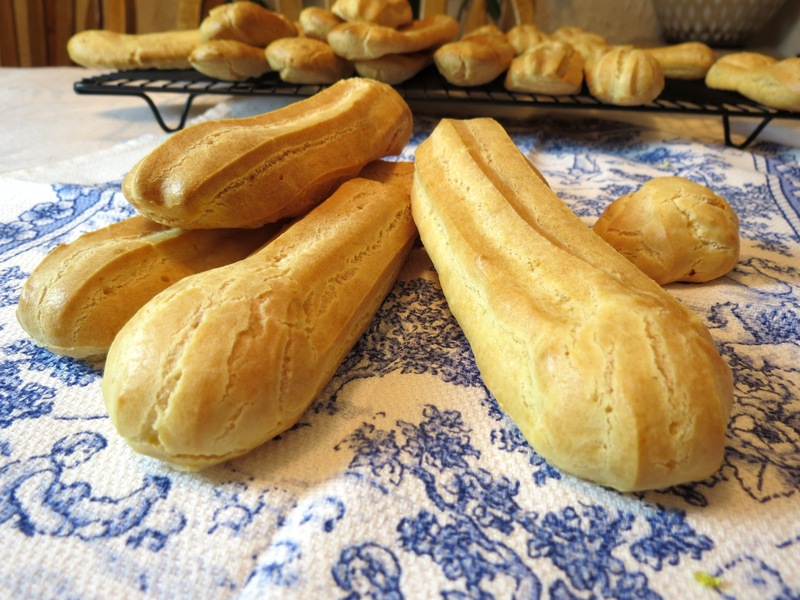 Eclairs are made of pâte à choux (choux pastry) which is a high-moisture dough that releases steam when it bakes which makes the dough rise and puff out. Essentially, the inside should be mostly hollow, allowing you to fill them with cream (or other filling of your choice). I followed the Bouchon recipe to a T and filled mine with chocolate pastry cream and topped with shiny chocolate glaze. For a first attempt at choux pastry, I think I did pretty good! 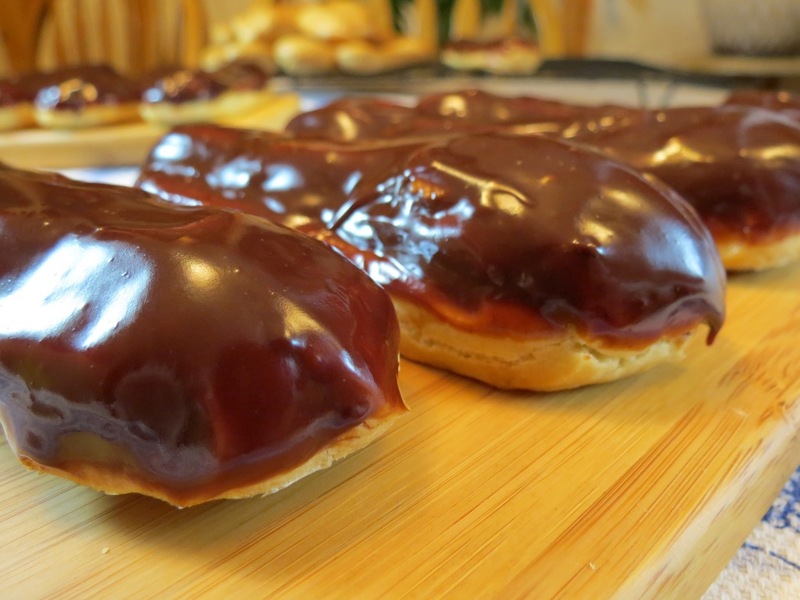 In the end, the eclairs tasted great – a perfect, decadent chocolate flavour. However, I did run into a few difficulties along the way. To be honest, the first batch was somewhat disastrous. Despite adding exactly the right amount of egg (measured to the gram! 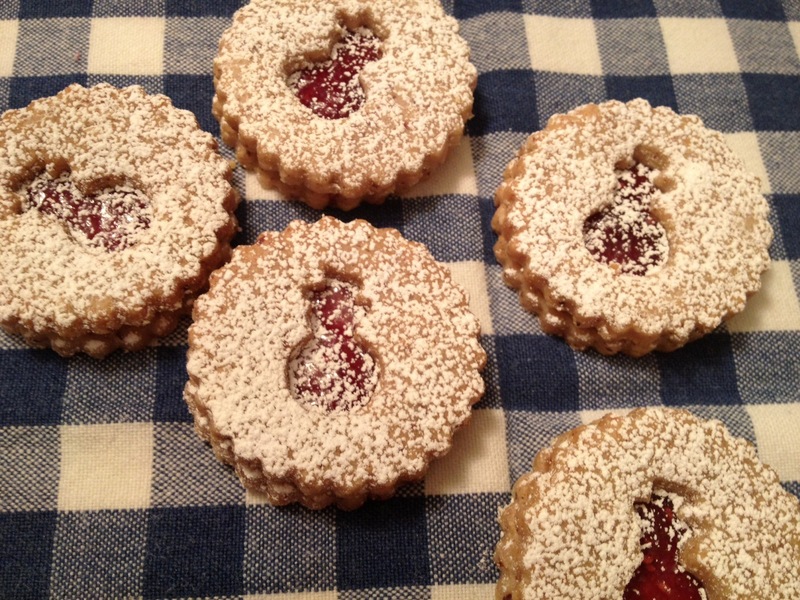 ), the batter was way too runny and the baked pastries were a flat failure. I immediately tried a second batch, adding less egg. This time the consistency of the batter was much thicker and held its shape when piped. The pastry rose quite a bit this time. Overall, for a first attempt, I was very pleased with the outcome and can’t wait to try it again. I will share the recipe once it’s been perfected. 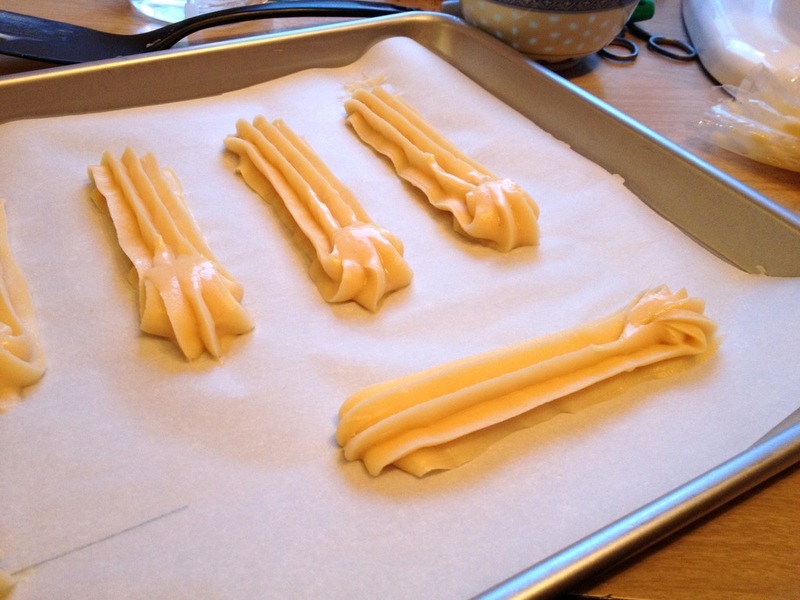 Have you guys tried making choux pastry or are you thinking of trying it? Do you have any tips you’d like to share? So we’ve been having -40C (with windchill) weather in Edmonton this week. I’m pretty sure my cell phone turned off today just from being too cold. 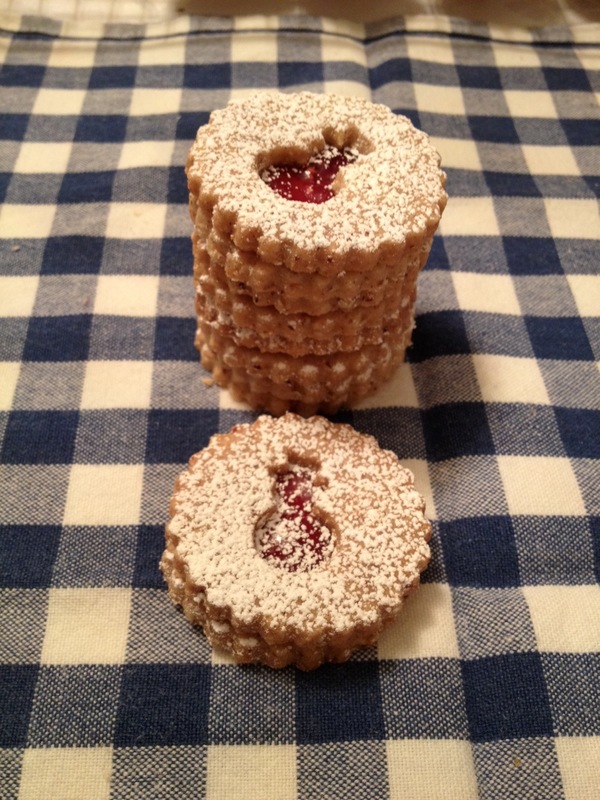 All of this cold weather just makes me want to stay inside and bake all day instead of going to work. 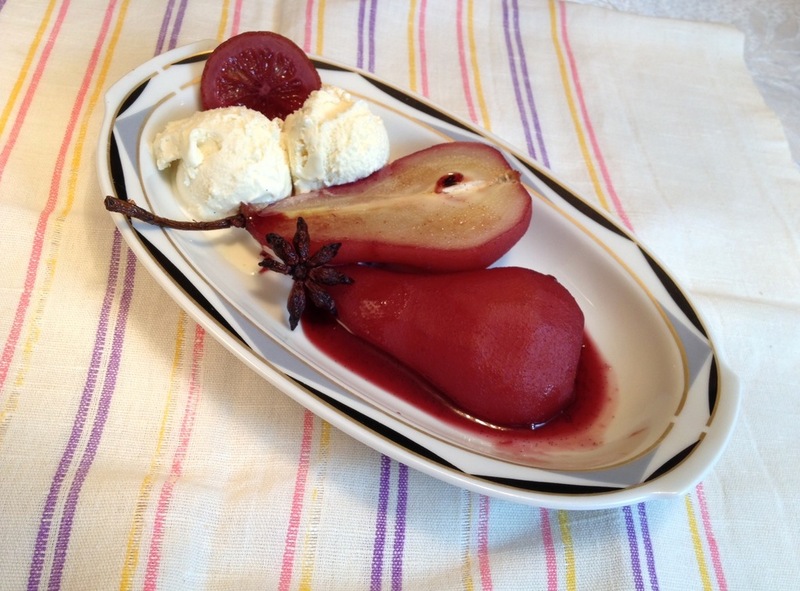 Unfortunately, I won’t get a chance to bake anything until this weekend, but today I’ll share a favourite dessert of mine. Creme brûlée is one of my signature desserts (and also happens to be my dad’s top pick out of all the desserts I make) so it gets made a lot at my place. While it may seem complicated and daunting… it’s really not! I mean how difficult could something with only 4 ingredients be? 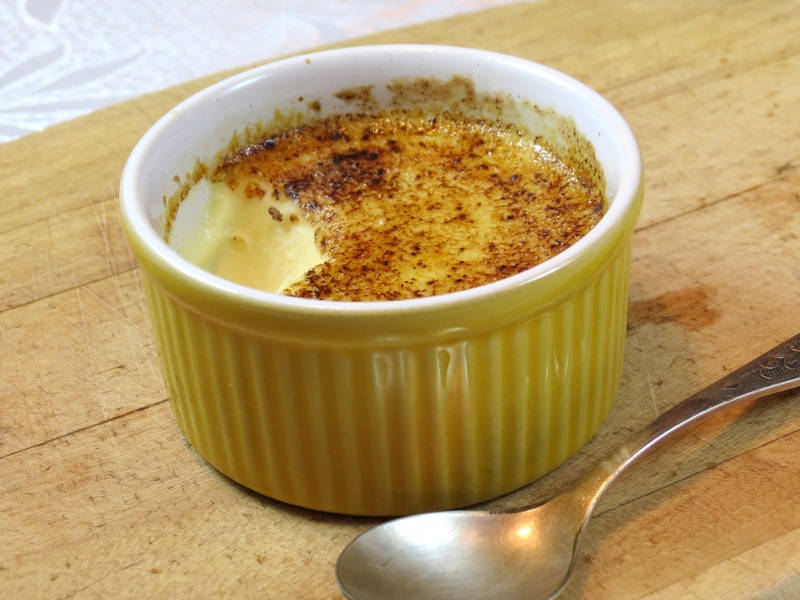 For anyone not familiar with it, creme brûlée is a custard-based dessert. The custard is then topped with sugar which gets torched and burned, leaving a thin crunchy layer on top – so delicious and impressive! The contrast of the crunchy, bittersweet top layer and the perfectly smooth vanilla cream makes for a perfect dessert. Most important is to temper the eggs – don’t add in the hot cream mixture to the egg yolks all at once. That would cook your eggs. Instead, slowly add a small amount of mixture (1-2 oz) to the yolks while whisking the mixture quickly. This will raise the temperature of the yolks and then the remainder of the mixture can be added freely. The creme brûlée should be cooked in a water bath. 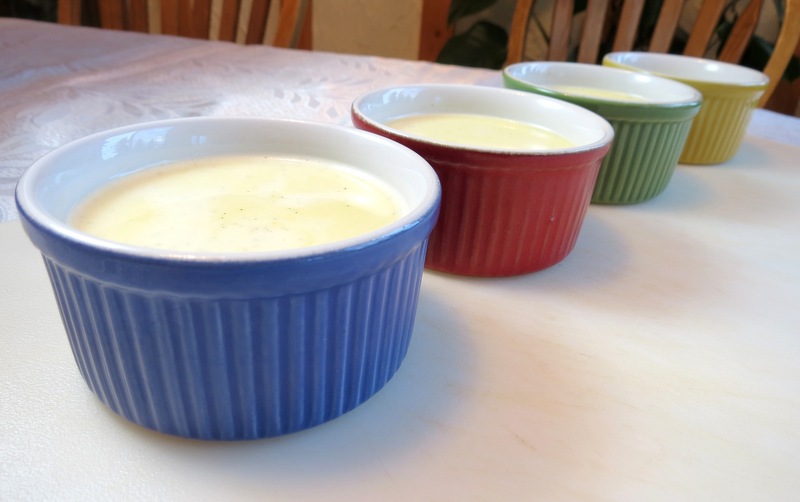 Essentially, you place the ramekin dishes in a large glass tray and surround the dishes of creme brûlée with boiling water before baking. This makes sure the creme brûlée cooks quickly and evenly. To prevent your ramekins from sliding around in the tray, you can line the bottom of the tray with a cloth. To torch your creme brûlée, I recommend a propane gas torch which you can get at a hardware store. These work great and you may already have one in the garage. You can also buy specialty torches for creme brûlée in culinary stores but these are definitely not necessary. Cooked, un-torched creme brûlée will last about 2 days in the fridge. Torch it right before serving. It also freezes quite well if wrapped in an airtight container. Enjoy the creme brûlée, guys, and let me know if you have any questions. Combine sugar and egg yolks in a large bowl. Mix until evenly combined. Use a knife to scrape out the vanilla bean seeds. Combine the bean, seeds and whipping cream in a small saucepan and bring to a simmer on medium heat. Simmer for several minutes to allow the vanilla flavour to infuse into the cream. Remove the cream from the heat and add a small amount of the hot cream mixture (about 1-2 oz) to the yolks, whisking it in quickly. 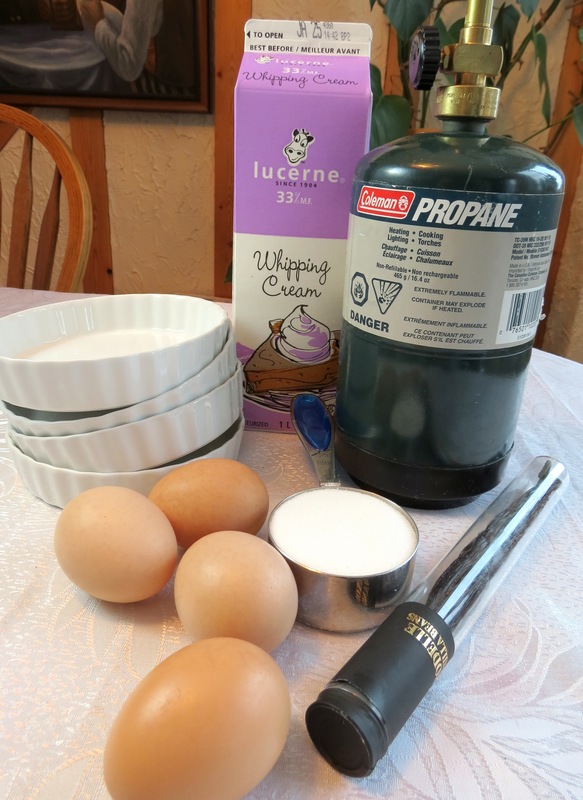 Once the egg mixture temperature has been raised, you can freely add the rest of the cream mixture. Pass the mixture through a strainer to remove the vanilla bean and ensure an absolutely smooth creme brûlée. Ladle the mixture into ceramic ramekins, filling each almost to the top. Use the back of a spoon to pop any air bubbles which may have formed on the surface. 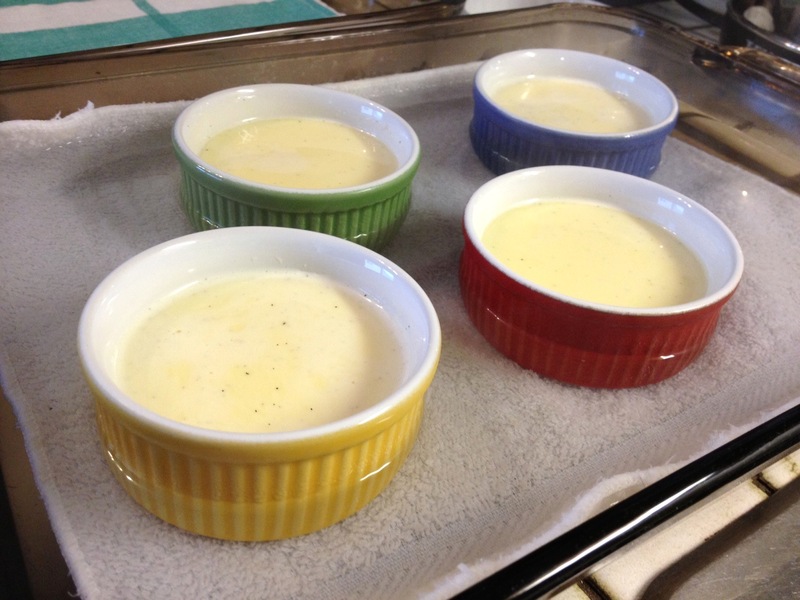 Place the ramekins in a large glass tray and fill the tray with boiling water about halfway up the ramekins . Bake at 325F for about 35 minutes. You can tell they are done when the surface jiggles like jello. Once the creme brûlée is baked, chill for at least 4 hours. Once fully chilled, sprinkle the top of the creme brûlée with enough granulated sugar to coat the surface. Tap off any excess sugar. 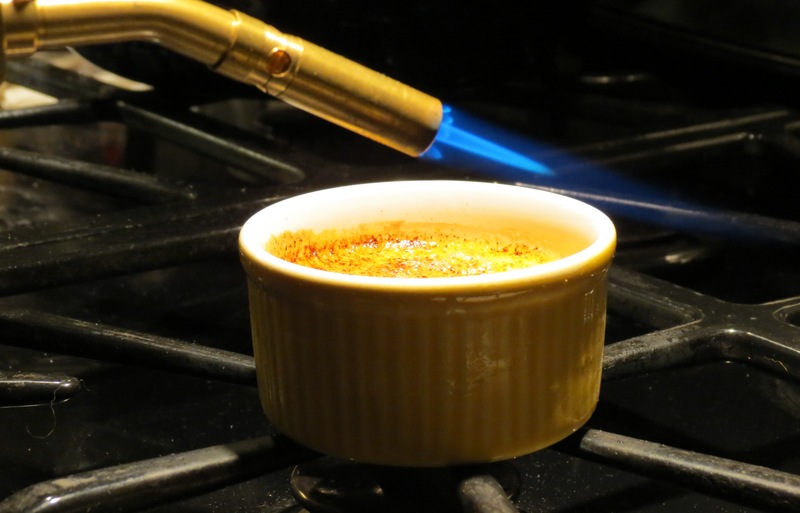 Use a blow torch at about 2 inches away to torch the top of the creme brûlée. Begin by torching the sides and working your way towards the centre. The surface will bubble and turns a golden brown colour with a few burn marks. Serve immediately. How’s everyone’s week going? Hope you guys survived Blue Monday ok! 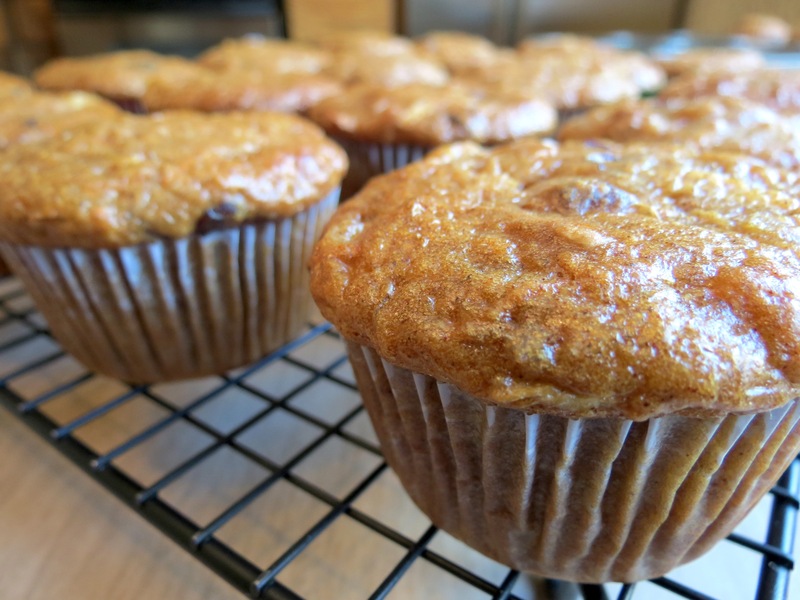 Last week a coworker asked me if I had a good morning glory muffin recipe… which I did not. I asked some family and friends for recipes and no one seemed to have one they loved. After all this talk of muffins, I started to really crave morning glory muffins myself so I decided to whip up a batch. I ended up making my own variation of a recipe (after looking through tonnes of recipes online and not being satisfied with any of them). A lot of them seemed to call for tonnes of oil which I didn’t want to use. To make mine healthy, I limited the oil to only a quarter cup and substituted plain yogurt instead. 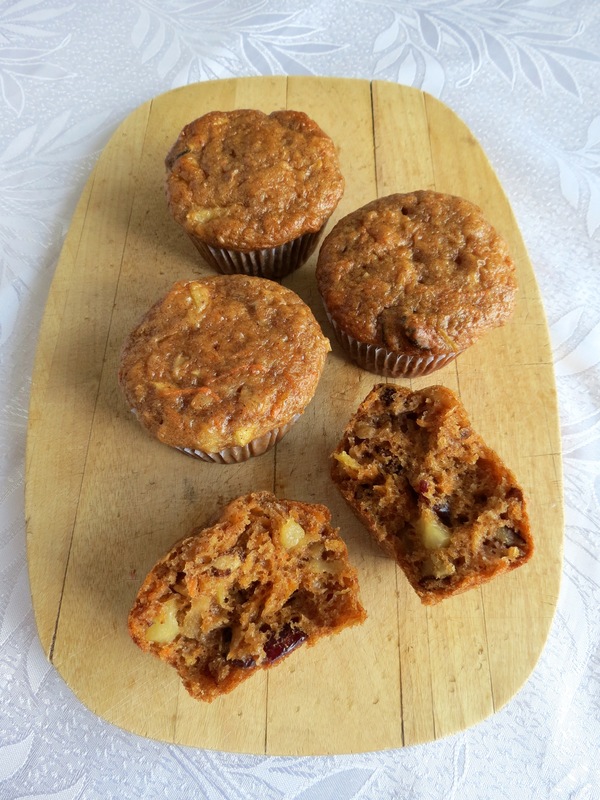 The result was great – super soft, moist muffins that are healthy too! I’ve been bringing these to work all week now and really enjoying them. While the recipe looks like it has a lot of ingredients, they are all easy to find and the recipe is super simple. You basically just mix it all together. So if you have a bit of spare time this week, make a batch of morning glory muffins – you won’t regret it! Preheat oven to 350F and generously grease your muffin tins. 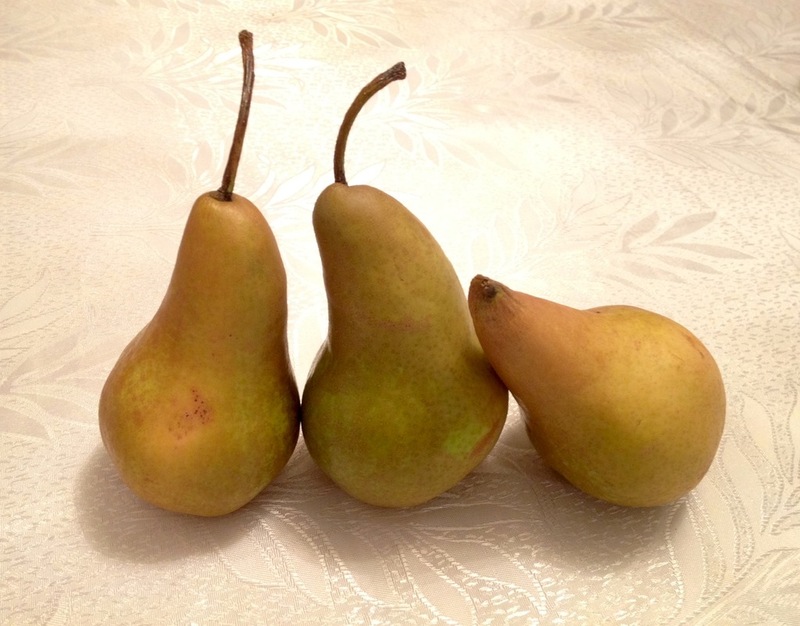 Combine flour, brown sugar, granulated sugar, cinnamon, baking soda and salt in a large bowl. Mix to combine. 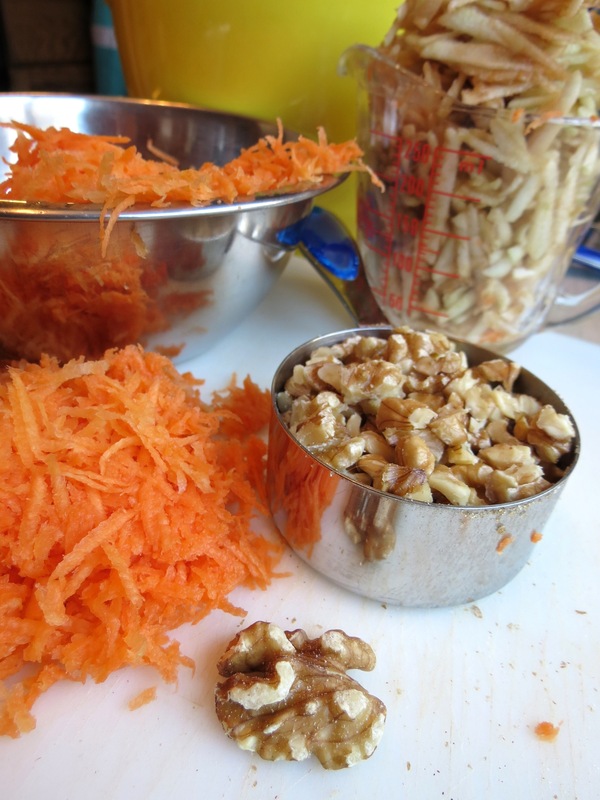 Add the pineapple, carrots, apple, coconut, cranberries and walnuts. Mix until combined. In a medium bowl, whisk together eggs, yogurt, oil and vanilla. Add this to the flour mixture and mix just until the batter is combined. 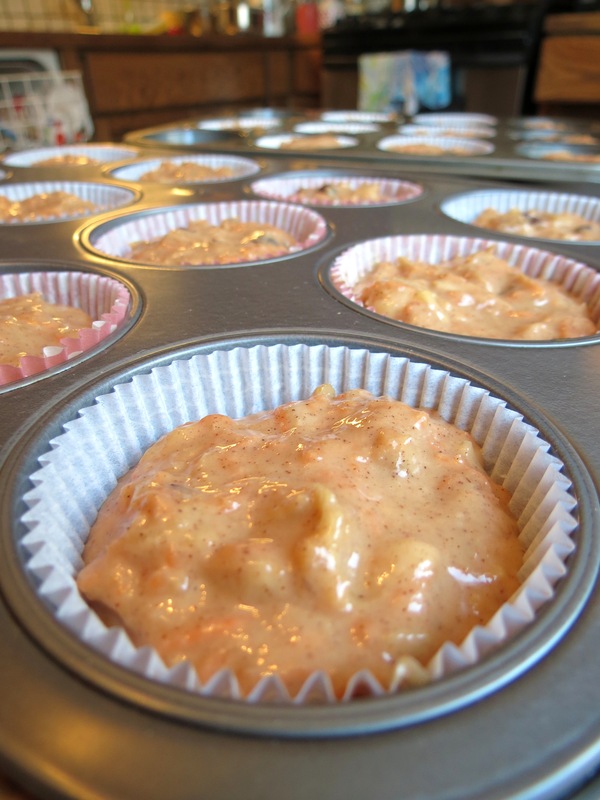 Spoon the batter into the muffin tray, filling each cup almost to the top - leave about 1/4" of space at the top. Bake the muffins for about 30 minutes, rotating trays halfway. Check for doneness by inserting a toothpick and ensuring that it comes out clean. I recommend not using paper liners with this recipe but baking the muffins right in the tray. 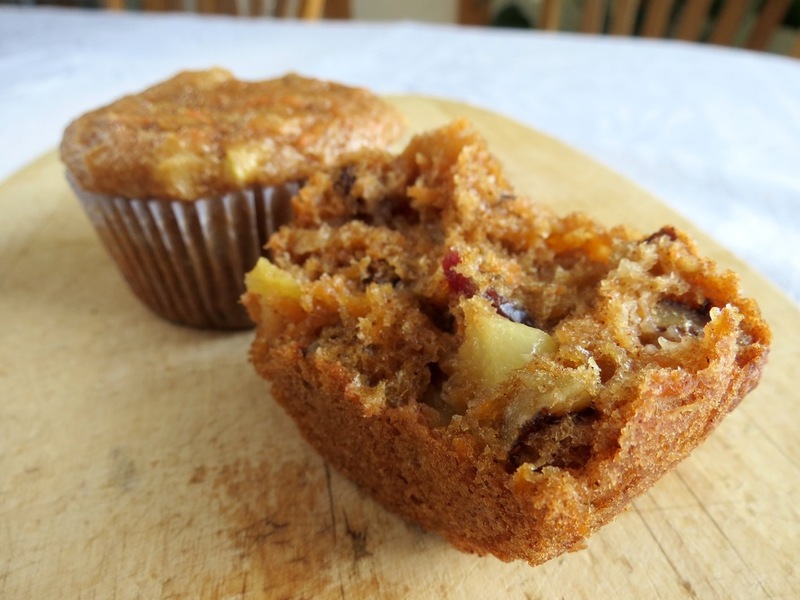 Since this recipe is pretty healthy – with no butter and limited oil – a lot of the muffin ends up getting stuck to your paper liner when you’re trying to eat it (and obviously no one would want to waste even a crumb of this muffin!). To bake right in the tray, ensure that the tray is well-greased. Once the muffins are baked, let cool a few minutes and use your fingers to release the edges of the muffin and remove it gently from the pan. If you don’t have a non-stick tray or are worried the muffins will stick to the pan, you can still use the paper liners – just make sure you eat up all the crumbs stuck to the paper. 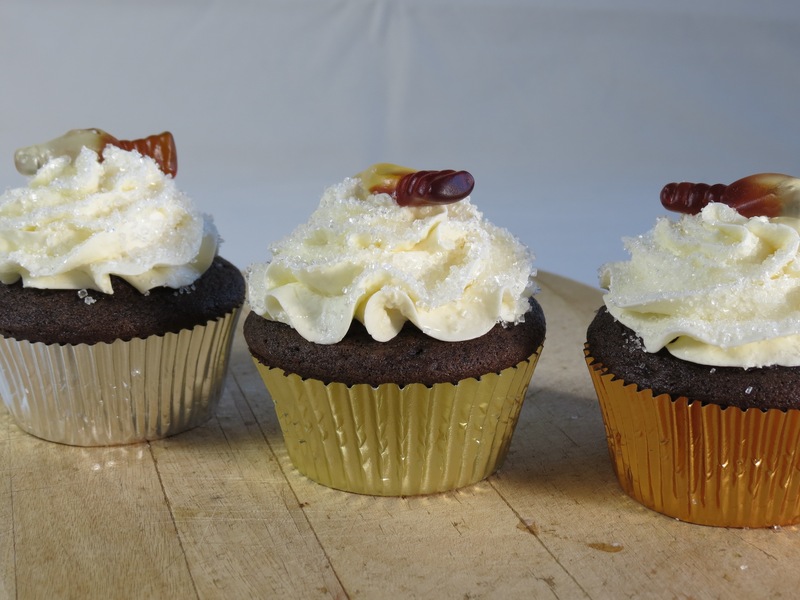 Muffins will store for about 3 days in a sealed container at room temperature, about 5 days in the fridge and several months in the freezer.